Fleetwood midfielder Bobby Grant hailed chairman Andy Pilley as he committed his future to the club until 2019. Grant made the short trip along the Fylde coast from Blackpool to Town in 2015 and has not looked back since. 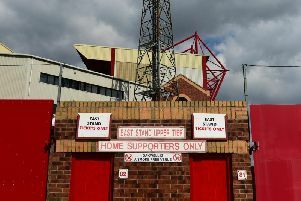 The Seasiders have dropped into the fourth tier and Town are in the midst of a historic season and a potential promotion to the second tier for the first time. Grant says happiness was a big factor in his decision. He said: “He actually tried to sign me a couple of times before I actually came to Fleetwood! “He’s a fantastic chairman who has rewarded me for what I’ve done for him and with what he’s done for the club speaks for itself. “I think, for me to sign a contract, it shows that I’m willing to commit myself to Fleetwood and it gives other people rewards as well. “It’s about security. Fleetwood is a place where I’m happy, and I think when you’re playing football you have to be happy. Grant has been deployed in midfield by Uwe Rosler this term and says the German’s attacking ethos suits him.